Spencer Cox mostly photographs nature from two different perspectives – from up high and far away, and extremely up close and personal. You might not think that one person could do both landscape and macro photography so wonderfully well, but Spencer can, and does. One can’t help but marvel at the scale and detail of his photos, which range from a view of a wide river valley in Iceland, taken from a drone, to a beetle covered in pollen sitting on a flower in Tennessee. Being one of the youngest photographers on my list, Spencer is still in college (he’s a journalism major). But he has a sort of quiet wisdom that’s beyond his years. Eventually, he wants to be a full time professional nature photographer. His main focus at the moment is landscape photography, but he started with macro (photographing the very small) in his backyard. He admits that this was probably due more to convenience than interest in tiny creatures, but as he kept practicing, he became more interested and passionate about the things he was photographing. On family trips to Florida, he would persuade his folks to get up unreasonably early to go find wildlife in the early morning light. Macro photography, or close-up photography of things like bugs and small plants, reveals things you wouldn’t normally see, even more so than normal photography. Animals that most people would miss are made visible. Spencer says, “I think a lot of people don’t know about these interesting creatures. You can walk by them every day, you can see lizards and dragonflies and stuff flying around every day, but there’s so many little details in them that, if you’re a photographer, you can capture that and show it to people … Photographers in general have that kind of weight on our shoulders to take pictures and show them to people who might not know about them otherwise.” After all, the little guys need every bit of good publicity they can get. When I asked Spencer about whether his photography had influenced how he thinks about biodiversity, he wasn’t really sure: “I’ve done it for a pretty long while, so it’s hard for me to separate, like, Spencer-with-photography from Spencer-without-photography.” However, he does acknowledge that his long-time passion for conservation and environmental care is almost certainly related to his nature photography. 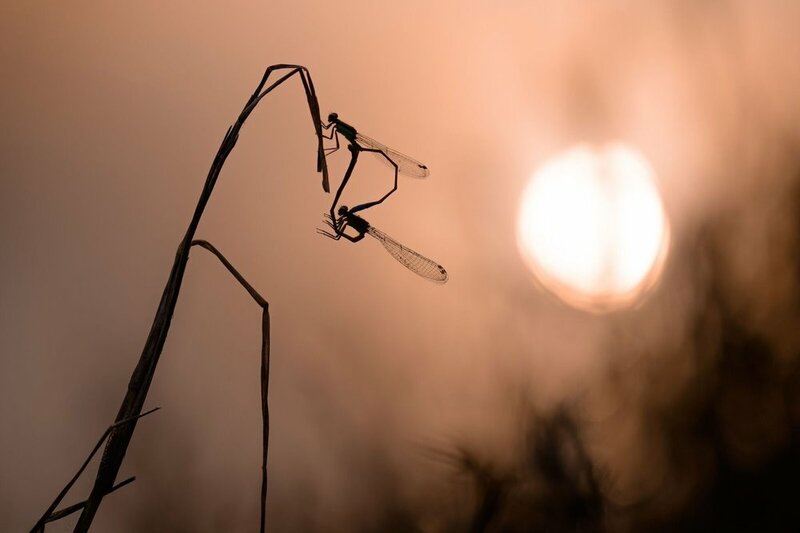 Being a landscape photographer makes it much more personal when a wild place is destroyed, and being a macro photographer creates emotional links with the creatures that live in that place. Taking pictures of those little creatures also teaches us about things we would never have known otherwise. This happened to Spencer when he photographed the lizard that earned him the title of Youth Photographer of the Year in Nature’s Best Photography. He fills me in: in the past, only green anoles lived on the mainland of central western Florida, while brown anoles lived on offshore islands. Then brown anoles came to the mainland via ships, and are overtaking the native green anoles (you might notice that the lizard in the photo below is brown, not green). On the grand scale of things, these lizards aren’t the most serious case of biodiversity loss at all, not even in just Florida. But all of the “small” issues are chinks in the armor of biodiversity. And the disappearance of green anoles means that that environment is no longer as unique and special as it once was. Unique places are really important to Spencer: “The fact that places are still different [from each other] to some degree is what makes them special.” If every place was the same, and had the same wildlife, why would we bother going anywhere else? The special places, in addition to housing entire unique ecosystems, attract visitors, which then boost the local economy and support the people there. It’s a win-win situation to keep those places wild and undamaged… not that that stops certain companies or political groups from trying to take over those places for oil or gas or mining. “Maybe I wouldn’t just me be able to change minds,” he says. “But if more and more people do that same kind of thing (take photos and share them), then it could chip away at people’s desire to give that land over.” He’s also currently working on some articles about being environmentally conscious and the ethics of nature photography, and he’s hoping that those will spread. Our ability now to share images and ideas in a split-second could mean that his contributions could change a lot more minds than perhaps Spencer initially thought. So while we’re losing biodiversity and wild places a little bit at a time, we can also protect them a little bit at a time. Spencer isn’t so sure that he’d immediately notice the effects of one animal going extinct, but he knows for sure that everything is so interconnected that there will be consequences somewhere. And gradually those consequences are building up into more serious problems. But he also believes that we can fight back on behalf of the special places and the creatures that live there – one photo and one photographer at a time. Favorite places to take photos: Iceland (for landscapes) and Pelican Island National Wildlife Reserve (for wildlife) – at least so far! Treat your subjects with respect, and learn what kinds of human behavior won’t scare them. When approaching dragonflies, move slowly side-to-side, like you’re moving with the wind, and approach slowly so as not to startle them.